FinTech: As Disruptive As They Say? One of the common tropes of the fintech revolution is how disruptive it is to the entire banking and financial industry. If you believe some of the more fervent fintech evangelists, it is only a matter of time before the majority of traditional banks are swept away by the revolution. But how much truth is there to this prediction? As is always the case with broad sweeping statements, the truth is far more nuanced. Part of this has to do with the fact that ‘fintech’ is such a general term and encompasses a wide range of financial services. Are we talking about payments, wealth management, or peer-to-peer lending? Fintech’s entry into each space has its own unique effect on the traditional status quo. In some areas it has been truly disruptive, in others it has yet to make a dent, while in yet other areas the traditional players are fast adapting and acquiring. One key regulation passed in recent years is PSD2, which is the Payment Services Directive. Under this regulation, banks are obligated to allow third party providers access to customer data and payment infrastructure via application programming interfaces. This presents a powerful opportunity for fintech companies, who can come in as these third party providers and eliminate the middleman in online payments. A 2016 PricewaterhouseCoopers survey of PSD2 regulation asked senior executives in 30 leading banks in eight European countries how they foresee PSD2 will affect their business. 88% expected PSD2 to have an impact on their business, 84% foresee strategy changes, 68% feel they will be weakened and are concerned about losing control of their customer interface, and 53% think there will be a risk of liability problems. 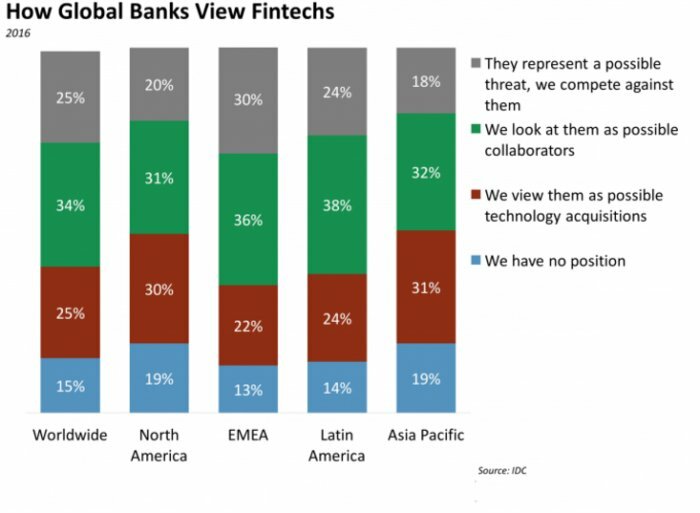 In another 2016 survey conducted by the International Data Corporation of 265 retail and corporate banks in 24 countries, it was found that the majority of banks (69%) actually viewed fintech companies as either possible collaborators or acquisitions. Only a minority of 25% of banks surveyed viewed fintech companies as direct competition. But if there are two areas where it is agreed that fintech has caused the most disruption to the traditional banking industry, it is in lending and asset management. Let’s take a look at one of the cornerstones of lending, mortgages. Increasingly, the process of a customer going into a bank branch and sitting down with a loan officer to get a mortgage is being replaced by a ‘digital mortgage’. In a digital mortgage, the applicant may be able to go through the entire process from application to approval with zero human intervention on the lender’s side. 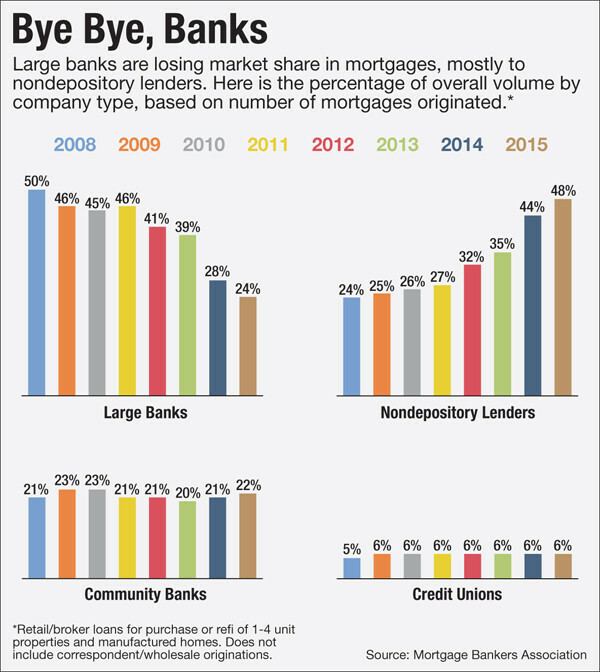 With banks hampered by regulations, non-depository lenders, particularly in the United States, have been quicker to innovate with digital mortgages. Quicken Loan, a mortgage lending company based in Michigan, USA, introduced its Rocket Mortgage toward the end of 2015. In the first nine months of 2016, the Rocket Mortgage saw over $5 billion in loan volume. Digital mortgages, among other innovations, have made a significant impact on the market share of the large banks. From 2008 to 2015, these banks saw their market share cut in half. While non-depository institutions are reaping most of the benefits from the rise of the digital mortgage, they are still a financial institution. Not so in the case of peer-to-peer (“P2P”) lending which instead matches borrowers with ‘investors’. And while the P2P lending industry is still in its infancy, research has suggested a stunning growth rate. Morgan Stanley has suggested a global volume of $150 to $490 billion by 2020. Transparency Market Research has suggested almost $900 billion by 2024. And those reports may be understating it; in June 2016, Chinese regulators revealed that P2P lending volume in the country totaled $93 billion! If you’re reading this article, then you’ve probably heard about robo-advisors such as Wealthfront and Betterment. If not, here’s a quick primer on robo-advisors: instead of personal financial advisors, robo-advisors are entirely algorithm based. Investors take a quick risk profile questionnaire and a particular portfolio allocation is suggested. These portfolios rebalance automatically and most offer features such as tax-loss harvesting. And the kicker is the management fees of these robo-advisors are low, ranging from 0.10% to 0.50% on average. Considering that traditional financial advisors charge at least 1%, there is a clear cost advantage. The industry has now embraced robo-advisory as part of the standard and hybrid robo-advisors have begun to emerge. The traditional wealth managers are now adopting robo-advisory services in addition to their regular offerings. BlackRock owns robo-advisor FutureAdvisor, and both Vanguard Group and Fidelity Investments have launched their own offerings. But even as the industry adapts to the presence of robo-advisors, the question of job loss lingers. As wealth management becomes increasingly automated, what becomes of the redundant human financial advisors? Barry Ritholtz, founder of Ritholtz Wealth Management and Bloomberg columnist has opined that “Fintech Is Ending Money Management as We Know It”. He notes that his own firm, with only 14 employees is able to be extremely productive thanks to fintech. Just as automation continues to threaten jobs in manufacturing, finance is not spared. As technology increases automation across an increasing number of industries across the globe, the debate rages, is fintech truly a form of disruptive innovation? The term ‘disruptive innovation’ was coined by Harvard Professor Clayton Christensen in his book “The Innovator’s Dilemma”. Christensen classifies disruptive innovation alongside sustaining innovation and efficiency innovation. Originating in low-end or new market footholds. Initially considered inferior by mainstream customers. Initially ignored by incumbents as unsaleable or unprofitable. Products gradually move upmarket and challenge the dominance of the incumbents. Looking at these criteria, how do the above examples of lending and robo-advisory stack up? Let’s take a look. Lending: The P2P lending platforms clearly meet all four criteria for disruptive innovation. The customers were people who could not get traditional loans, meaning they were at the low-end of the market. These platforms were also considered inferior by mainstream customers i.e. those who qualified for traditional loans. And while the incumbent banks dismissed these platforms when they first emerged, these platforms are going increasingly mainstream and are already beginning to threaten the incumbents’ dominance. This applies to crowdfunding platforms as well, in relation to the traditional venture capital firms. Robo-advisory: Similarly, the robo-advisory industry also meet all the disruptive innovation criteria. With low minimum account balances, they target the low-end of the market; those who do not qualify for traditional wealth management services. Those with sufficient capital to qualify for wealth management services, the mainstream customers, also looked down on these platforms at first while the incumbents did not consider fully automated wealth management services something that could ever take off. Finally, robo-advisors have been following an upmarket trajectory, expanding their offerings and targeting higher and higher net worth clients. Does this mean that all of fintech is disruptive innovation? As we said in the beginning, the answer is far more nuanced. We can easily point to other fintech innovations that do not meet these criteria. For example, fintech innovations in the payment solutions arena (such as Stripe and Square) target the exact same customers as the incumbents. Fintech’s influence will only continue to grow, but whether that growth is truly disruptive or not is not a conclusive answer. The traditional financial institutions continue to invest in fintech and innovate their own services, maintaining their position in the status quo. If the positions of the traditional financial institutions continue to be maintained, is this actually disruptive? And how about job losses? If the only disruptive result of fintech is job losses within the financial industry from increasing automation and efficiency, does that count?